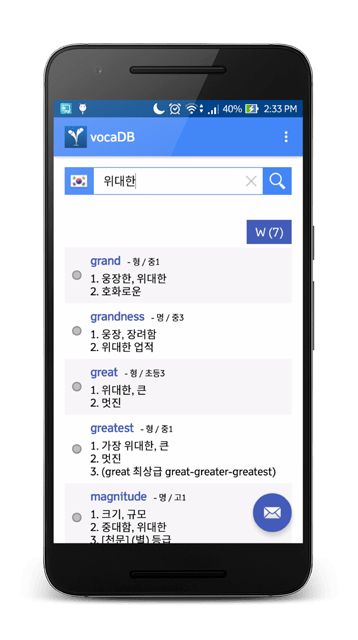 Why can we enter only one word when searching dictionary? Isn't it more convenient if we can enter multiple words and get their meanings and translation simultaneously? 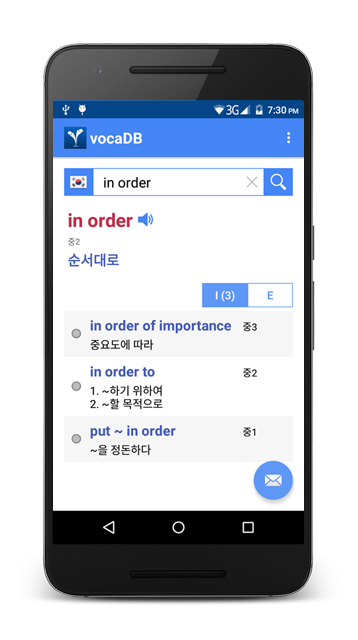 That's the reason we developed VocaDB Dictionary, a solution that can automatically extract words and idioms from the text. It supports 38 different languages. 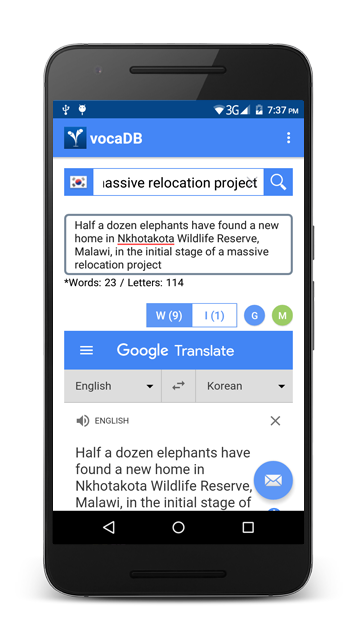 Our Dictionary app is powered by VocaDB APIs including Dictionary API, SDE API (Synonyms, Definitions, Examples), User Participation API, and the APIs of Google Translate and MS Bing. 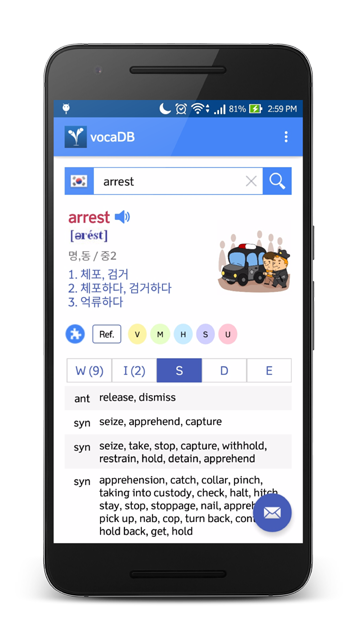 The app can search a word, extract words and idioms from an input text, provide related words and idioms, and a lot more. This document is intended for developers who want to build mobile apps that can interact with our APIs. 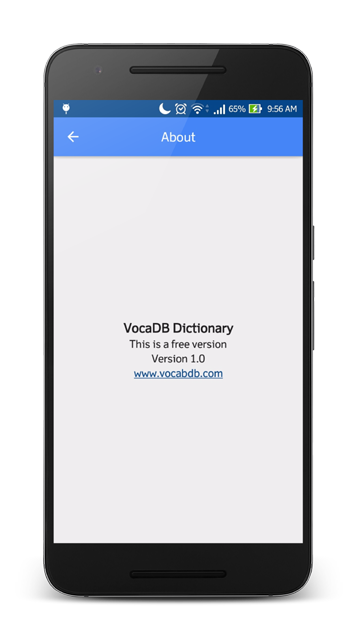 VocaDB Dictionary app is compatible with Andriod 4.1 (Jelly Bean) and up. For more information about the configurations of the app, please check the build.gradle file under vocaDBDictionary/app. 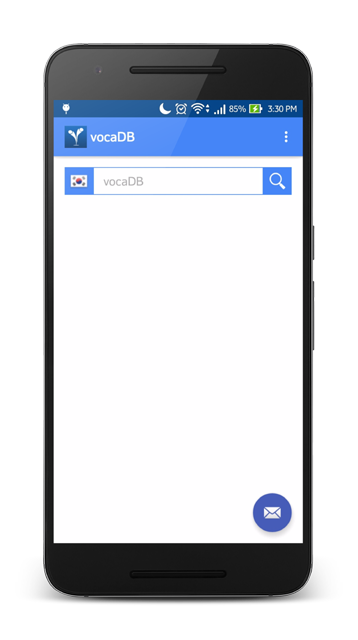 This section provides steps on how to import VocaDB Dictionary app on your workspace and run. Start Android Studio and close any open Android Studio projects. From the Android Studio menu, select File > New > Import Project. 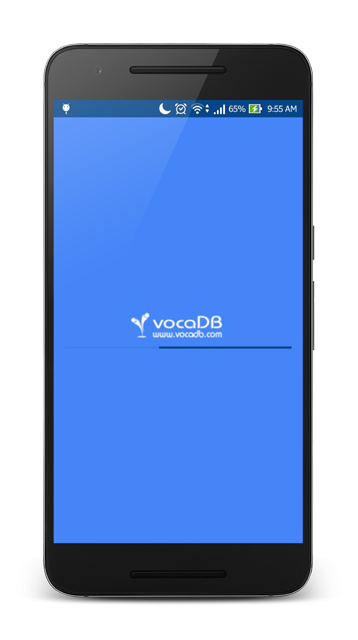 Select the VocaDBDictionary project folder with the AndroidManifest.xml file and click Ok. Select the import options and click Finish. 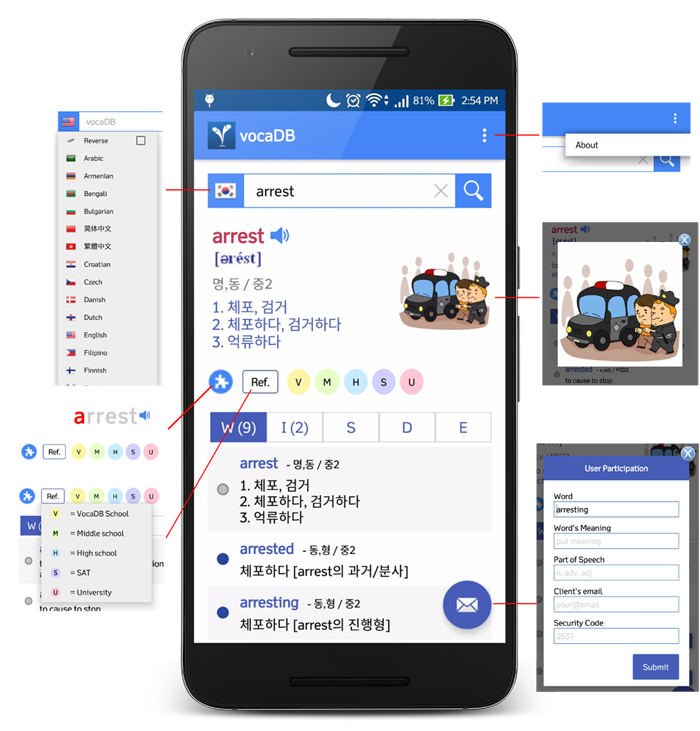 The app uses the AQuery library for doing asynchronous tasks and manipulating UI elements. Include the .jar file under vocaDBDictionary/app/libs. Also, add the compile dependency in build.gradle file. Other dependency libraries are also included in the file. The app contains one or more modules with source code files and resource files. This folder contains objects for making a View for each item in the data. This folder contains classes that other subclasses are derived. This folder contains classes that manage database creation and version management. This folder contains classes that provide functionalities for other classes within the app. This folder contains classes that model the objects associated with creating, reading, updating, and deleting. This folder contains classes that is used for parsing JSON response. This folder contains classes that define a set of methods which perform common, often re-used functions (static). This folder contains classes that represent the basic building block of user interface components. The primary function of a dictionary is to provide the meaning of a particular word. Unfortunately, common dictionaries are limited to one word input. 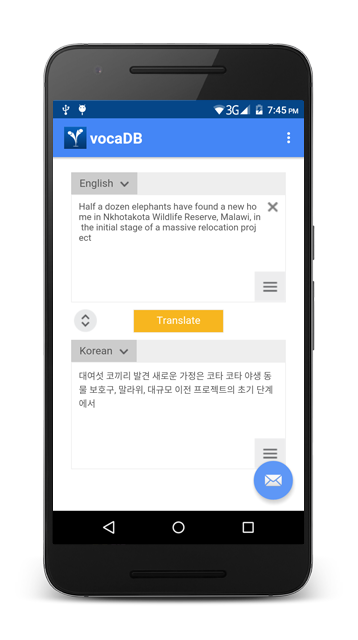 The VocaDB Dictionary app supports text or sentence inputs. When you make a request, the API provides different return types based on four input types: normal word, idioms, non-English word, and text. A plain word input with no spaces. An input containing words with spaces. 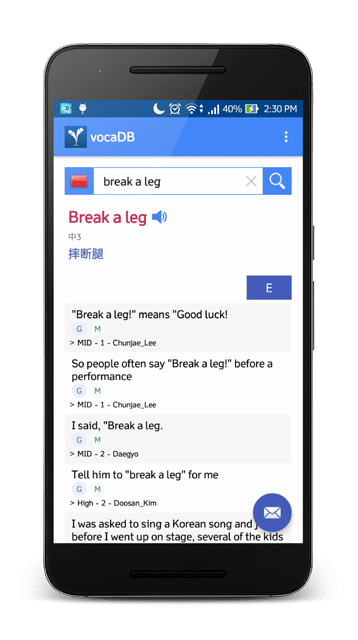 Word or character inputs such as 成功, 最高, 성공. An input containing phrases or sentences. 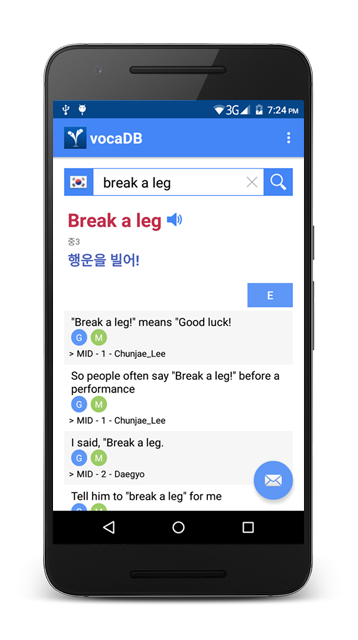 English is the default language of the input text (source language or slang) and the search result (target language or tlang). 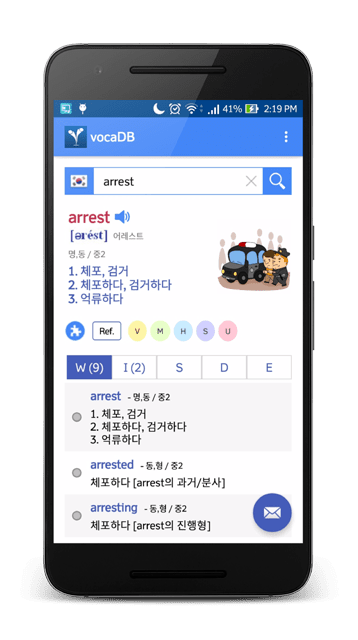 However, the search result can be set to another language. 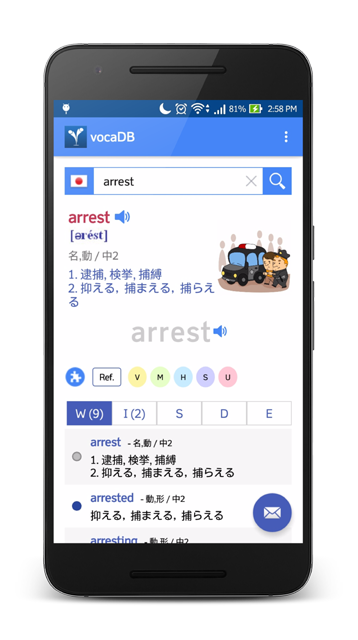 The app also has a reverse search function. 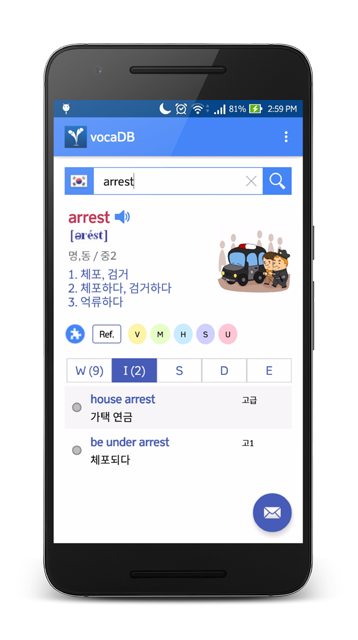 When enabled, the system allows a non-English input text with search result in English. The following code initialize all language and set the corresponding drawable flag based on source language (slang) and target language (tlang). 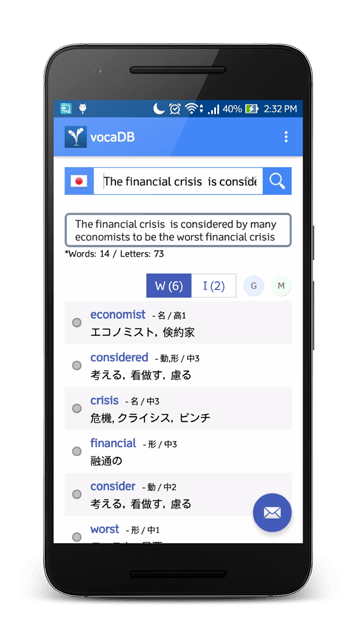 The app has an English level selection which filters the words and idioms to be extracted from a text as well as their corresponding definitions. 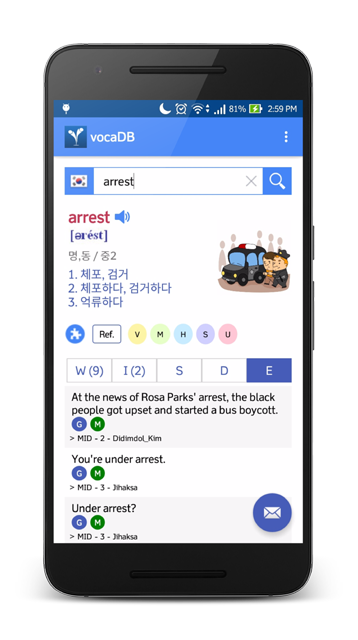 If elementary level is selected, for example, it will only extract words and idioms for elementary language learners. The app will extract with no filter if nothing is selected. 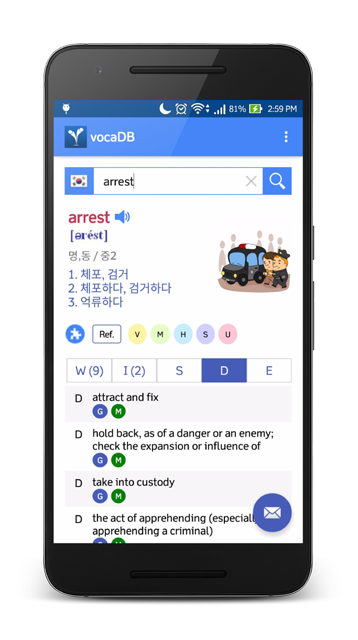 The app can also translate texts to a desired language. Just click for Google Translate and for MS Bing. Make sure that the target language is set to a non-English language. 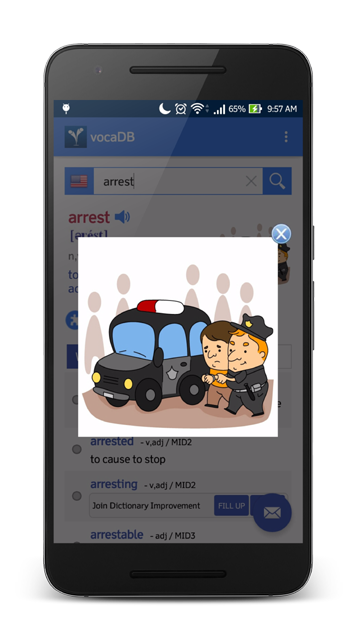 The app allows users to add new words and idioms and to contribute definitions to improve the database. This feature requires user e-mail and security code. To show the User Participation dialog, simply call the showUserParticipationDialog() function. 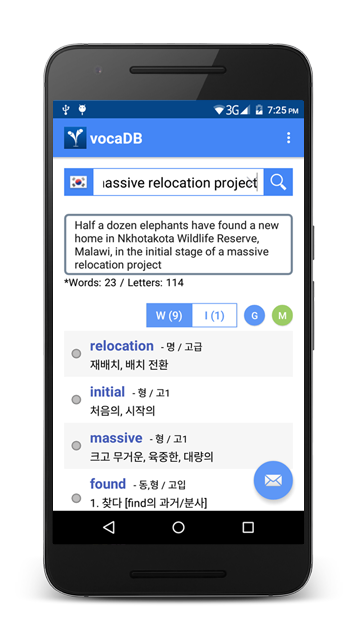 The app also has a puzzle feature for easy memorization of searched words. The color of each letter changes when clicked. To show puzzle, simply call the createPuzzle() function. The Dictionary API allows developers to make requests and get responses in JSON format. The API key for this app is defined in app/your_app_package_name/base/Constants.java. All URLs are defined also in app/your_app_package_name/base/Constants.java. It is important to add the custom header named x-voca-apikey, along with your API key. Also, don't forget to add UTF-8 encoding type to the request. © vocaDB. All rights reserved.